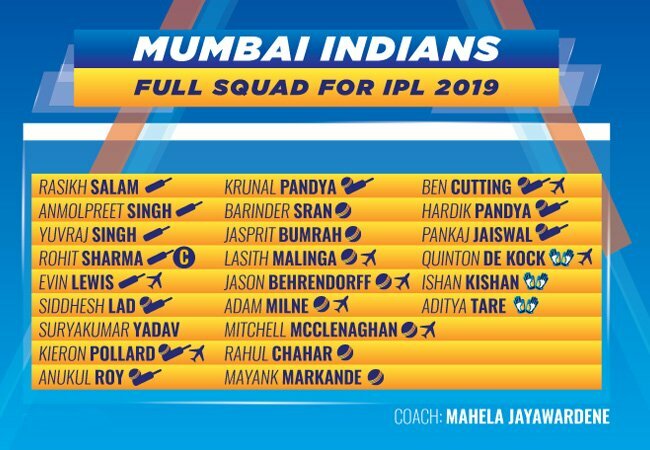 Mumbai Indians Predicted Playing XI: CrickeX presents before you CSK playing XI for IPL 2019. The team management’s decision to send in a novel opening pair of Suryakumar Yadav and Evin Lewis reaped fruits for the team last season. Having said that, Mumbai buying South Africa wicket-keeper batsman Quinton de Kock might force them to tinker with their opening duo. One doesn’t expect Mumbai Indians to make much changes to their middle-order. With Sharma at No. 4, he has it in him to play both the roles of building an innings or going against the bowlers from the word go, depending on the situation. In fast bowler Jasprit Bumrah, MI have arguably the best contemporary death bowler. In 61 IPL matches, Bumrah has dismissed 63 batsmen at an average of 28.20, an economy rate of 7.79 and a strike rate of 21.71. It would not be wrong to say that the 25-year old cricketer will lead the Indians’ bowling line-up.